Are you hunting for the best Japanese rice cooker? Whether you want rice as the base for sushi or as the accompaniment to a range of other dishes, cooking it well is deceptively difficult. Unless, that is, you make a modest investment in a dedicated rice cooker. Today, our focus is on Japanese brands and we’ve got a snapshot of 5 leading lights in the industry so you can see where to best spend your hard-earned money. After that, we’ve got the results of some extensive testing and we’ll bring you a capsule review of 10+ of the best japanese rice cookers on the market. 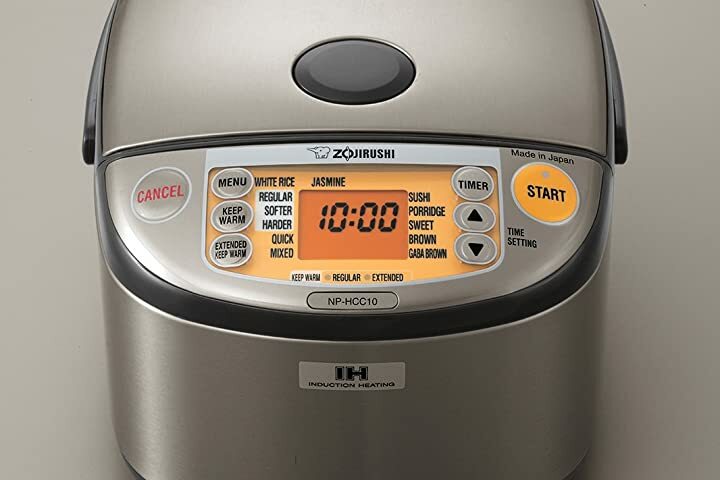 For a simple but highly effective rice cooker from an industry legend, the Zojirushi Neuro gives you fuzzy logic and perfect rice every time with a 10-cup capacity. If you can overlook the questionable design, this model excels on all other fronts and grabs our vote for best overall pick. Although you’ll be limited to cooking white rice, the Tiger does this one job incredibly well. If you’re looking to whip up some rice for sushi, this simple but highly effective model makes a smart choice. You’ll be able to keep your rice nicely warmed once cooked, too. This stainless steel beast is large enough to rustle up 10 cups of a wide array of different rice using the induction heating principle for powerful, consistent results. While it’s not particularly cheap, if you’ve got a fluid budget and exacting standards, we can’t recommend this Zojirushi highly enough. Zojirushi rice cookers are made in Japan. 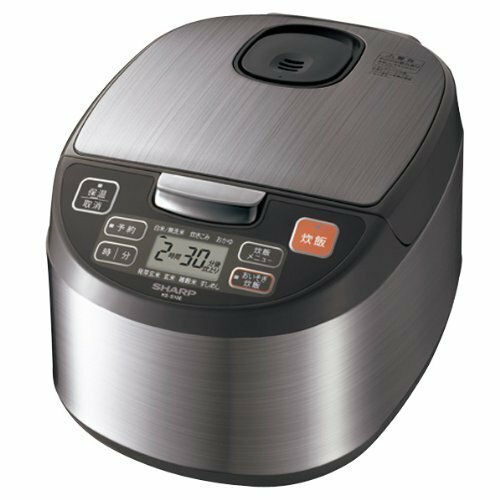 This is by far the most popular brand of rice cooker globally and is also the go-to choice for Japanese, the maestros of cooking rice the right way. From bare bones and basic brands to range-topping beauties, Zojirushi has a broad and deep range. Zojirushi offers conventional models of rice cookers that have been around a long time. Their Micom cookers use a small onboard microcomputer to automate rice cooking wonderfully. These microcomputers ensure your rice is cooked to perfection by adjusting the temperature and cooking time of the rice without you needing to lift a finger. Many of Zojirushi’s models also have the ability to cook other foods like oatmeal. Whether you’re a budget-buster or a penny-pincher, Zojirushi has a model for you and all of them will exceed your expectations. Tiger rice cookers are made by the Tiger Corporation which is headquartered in Osaka, Japan. In the early 2000s, they created a US branch of their corporation as well. Tiger is another extremely popular brand of rice cooker, and for good reason. These appliances belong to the super-premium pot segment. From traditional models to 4-in-1 appliances, you’re spoiled for choice with Tiger. 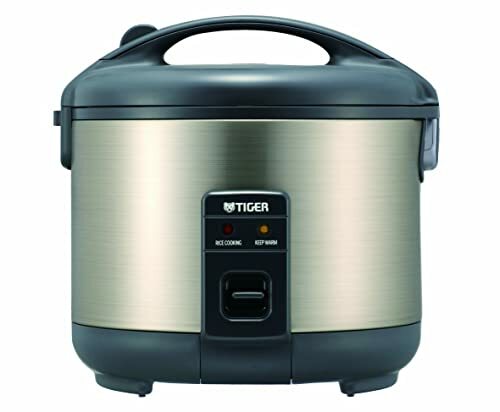 The Tiger Corporation was the first in the industry to offer a rice cooker harnessing induction heating, and they are continually developing models using pioneering technology. Many cookers from Tiger also use Fuzzy Logic microcomputers that guarantee perfectly cooked rice every single time with minimal user input. Whether you’re in the market for a basic rice cooker, or you’re more interested in a model that can do all but clean the dishes, Tiger can meet your needs head-on without bankrupting you in the process. 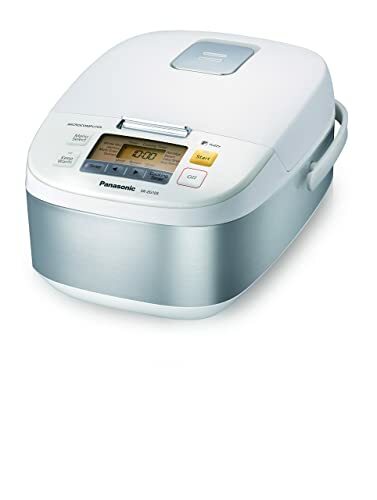 Panasonic is a company better known for electrical products like televisions and stereos, but many people don’t know that they also produce appliances like rice cookers for the kitchen. 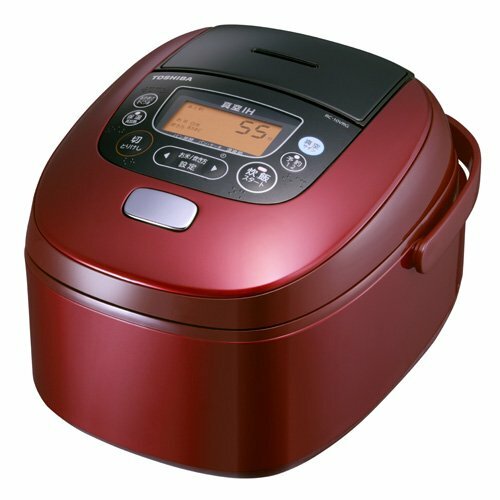 Hailing again from Japan, this is another popular and highly affordable brand of rice cooker without stiffing you in terms of performance. Again, you can find everything from basic and more pedestrian models to rice cookers jammed with bells and whistles. If you like to make a big batch of rice and have it at the ready throughout the day, be sure to choose a Panasonic model with a “keep warm” feature, as not all of them do. Panasonic also uses microcomputers in many of their cookers allowing you to rest easy knowing your cooked rice will come out fully optimized for any dish you wish to make. Sharp is also known for their technological prowess, which extends from living room appliances into the kitchen with their rice cookers. Sharp is relatively new to making rice cookers, but you shouldn’t let that deter you. 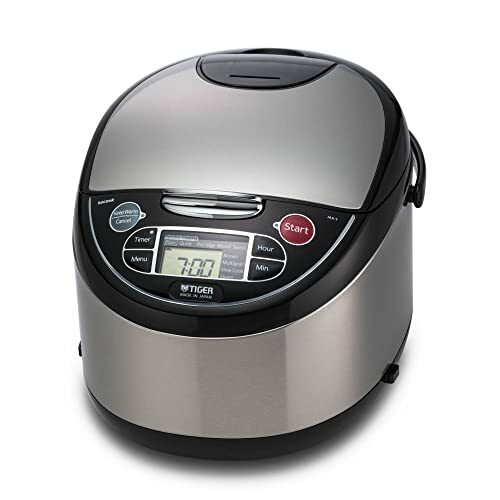 With a keen focus on technology, these models make use of induction heating and pressure cooking with one model even stirring the rice as it cooks it. All these options will result in rice cooked to absolute perfection. Toshiba brand rice cookers are made out of Hong Kong and are a solid option. Toshiba is yet another company known worldwide for creating products that are technologically advanced yet remarkably user friendly. Because of this, you won’t find any basic or no-frills rice cookers in Toshiba’s lineup. This shouldn’t be troubling though, because while the other cookers might initially feel a bit more complicated, using them results in fluffy, delicious rice. With Toshiba, you’ll find a wide array of sizing ranging from 2 to 8 cups. 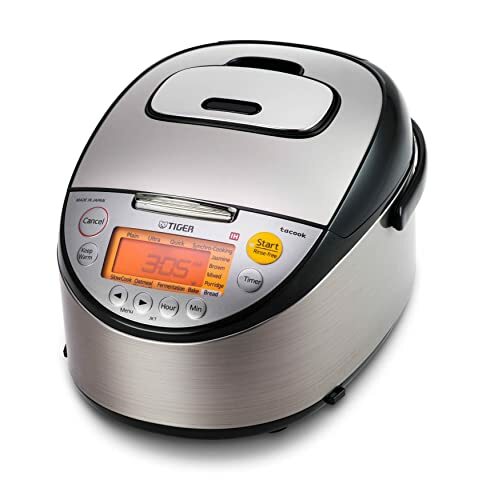 Also, you can choose from a regular rice cooker that uses a kettle and traditional heating system or you can opt for more advanced models with a magnetic induction heating system. Zojirushi brings a basic, no-frills option to the table with the Neuro. While the appearance is nothing to write home about, the pure functionality of this workhorse more than compensates. The capacity is enough for a hearty 10 cups of rice so you can easily feed a large, hungry family or a gathering of friends in a single session. 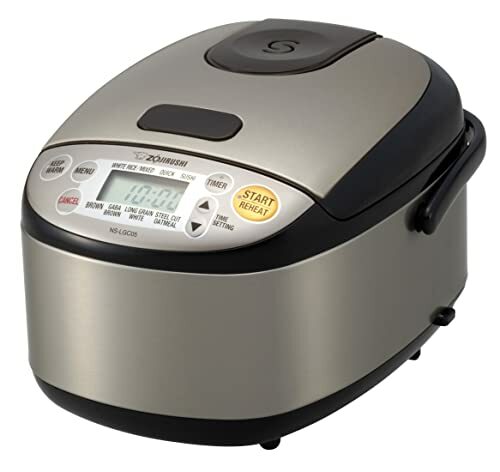 This rice cooker can be used to cook a variety of rice including both white and brown. The user-friendly menu functions allow you to program how you want your rice cooked from sushi style to porridge removing effort almost entirely from the equation. Tiger brings a rice cooker that’s both exceptionally functional as well as aesthetically pleasing to our attention with this model in the JNP series. There’s no need to worry about having to understand a dozen high-tech functions when using this model. Instead, you can effortlessly cook basic white rice at the push of a button. 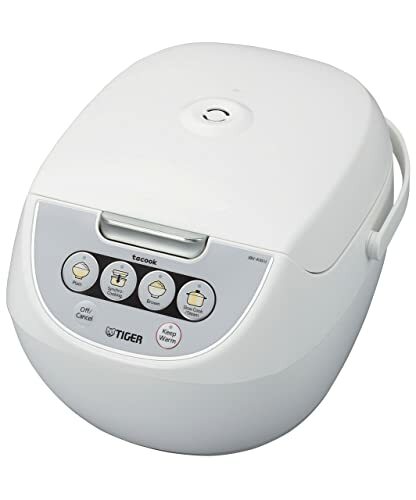 While Tiger has a variety of sizes available, this particular model has a capacity of 10 cups of cooked rice, which is more than enough for most purposes. This cooker also has a keep warm function that will keep your rice primed and ready to eat for up to 12 hours. Not only will this clear-coated stainless-steel rice cooker look beautiful in your kitchen, it will give you some of the best rice you’ve ever had. 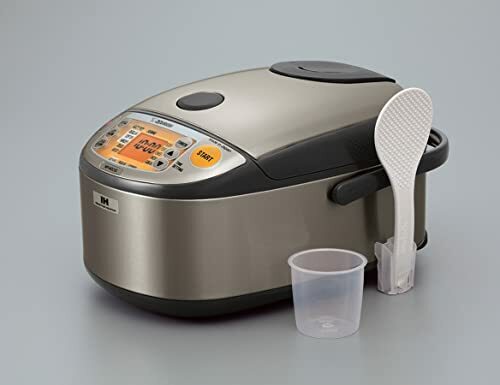 Through induction cooking technology, this rice cooker from Zojirushi will allow you to make a perfectly and evenly cooked pot of rice every time without fail. 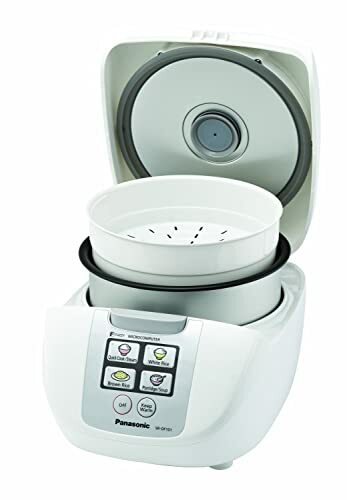 When using this appliance, you can make 10 cups of a variety of rice, from white through brown. You can also easily tweak settings so you get it just the way you like it. Get them all with the Zojirushi and get them perfectly cooked each and every time. Though smaller than some other options we’ve listed – you’ll only get 3 cups of cooked rice here – the stainless steel Micom from Zojirushi is a great stealth option for smaller kitchens. 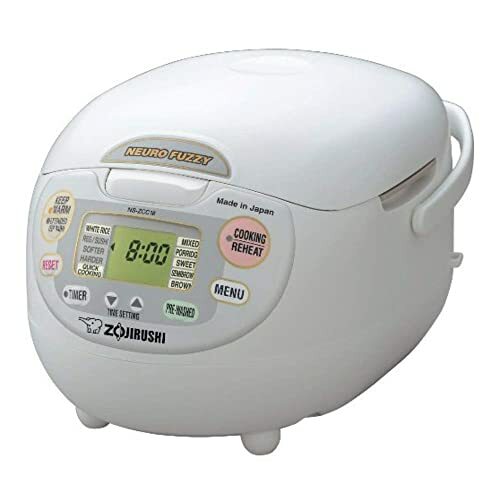 Like several other models from Zojirushi, you’ll get fuzzy logic so the rice cooker senses what’s going on inside and adjusts the temperature settings and cooking time to cook the rice to your specifications. With the ability to make several different types of rice along with oatmeal, this cooker is a perfect multifunctional tool for any kitchen. Also, there’s a handy keep warm feature that will leave your rice ready to go for hours on end. Another option using the magnetic technology of induction cooking, this rice cooker from Tiger is a superb choice. This model is extremely versatile. Not only can you cook 10 cups of plain white, jasmine, brown or mixed rice, it can also be used to make porridge and oatmeal. If that isn’t enough to catch your attention, this machine can be used as a slow cooker or to bake bread. Also, the built in Tacook allows you to cook your main meal in the cooker while your rice is being made. Though the exterior of this rice cooker looks plain and simple, inside lies the mighty Fuzzy Logic technology that allows your cooker to adjust its temperature and cooking time to perfectly cook your rice according to your preference. There’s no need to worry about the system complicating operation, either thanks to Panasonic’s simple One Touch design. Choose from Quick Cook, White Rice, Brown Rice and Porridge/Soup then simply press the corresponding button to begin cooking your 10 cups of rice. The steam basket included allows you to steam your vegetables and other sides while cooking your rice, saving you some precious time. With this model, Tiger brings another multi-use rice cooker to the table. This particular cooker is easy to use while very simple in design. As with most Tiger rice cookers, this one features an Automatic Cooking Logic system. This system allows the cooker to monitor the internal temperature to adjust and cook perfect rice for your meals. With a 10-cup cooked rice capacity, there’s plenty to go around while the stay warm function will keep the rice ready for everyone to get a chance to eat. In addition to rice, this cooker can also function as a slow cooker, and the Tacook plate gives you the ability to cook different parts of your meal simultaneously. This Tiger 4-in-1 model of rice cooker has plenty to offer. With multiple cooking settings from a single button through to an easy-to-clean exterior and crisp LCD screen, you can’t go wrong here. This cooker can cook a whopping 20 cups of rice, which is enough to feed you and your whole family and then some! In addition to white, brown or mixed rice, you’ll be able to cook sweet rice or porridge. This cooker can also be used to slow cook or steam foods. Tiger’s proprietary Tacook plate allows you to cook other food using the steam from the cooking rice. 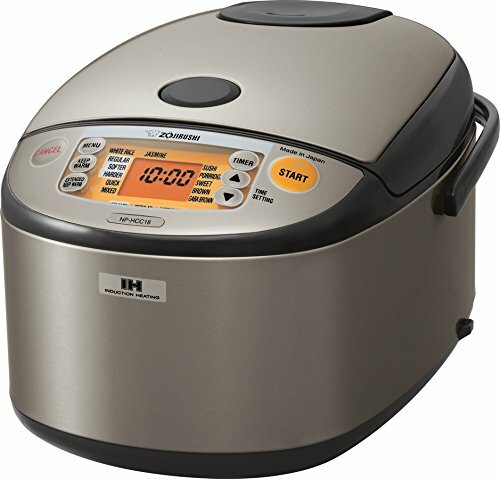 Containing a Fuzzy Logic microcomputer, this rice cooker will work with you to ensure that the rice you serve is completely optimized with minimum effort on your part. As the rice cooks, the Panasonic will monitor the temperature and make adjustments to deliver rice just the way you want it. This cooker is the perfect size for families as it can cook up to 10 cups of rice, and the keep warm function will maintain the rice at the perfect temperature for up to 12 hours so you can always come back for more. Not only can you use this cooker to make rice, but with 13 different pre-programmed selections, there are many other things you can use it for from quinoa and oatmeal to soups and chili. This rice cooker model can cook white rice as well as brown rice. Slightly smaller than many of the models we tested, it can cook only about 5 cups of rice. Remember, though, this doubles up when cooked so it should be more than sufficient for most needs. Sharp has ensured this rice cooker is very user-friendly. With a large LCD display screen, you can monitor the progress of your rice as it cooks, and the clear water level scale allows you to see how much liquid is in the pot. Also, you can easily start your rice cooking by pressing a single button. TOSHIBA brings us this innovative rice cooker that combines bleeding-edge technology with traditional rice cooker methods allowing you to create the best pot of rice possible. The controls are simple to navigate, and the rice cooker can be used to make 10 cups of cooked rice. With a sleek and modern design, this rice cooker sets off any kitchen a treat. The cooker combines induction-heating technology with a double pump pressure system to cook rice in the pot. This unique design allows each grain of rice to cook to perfection with no effort at all required. By now, you should have a clear idea of which Japanese rice cooker would make the most effective addition to your kitchen. Once you’ve established the type of rice you cook most along with the capacity you need, it’s really just a question of determining which style is most suited to your requirements. Whether you want a tech-driven rice cooker or a more stripped-down and traditional appliance, there’s something for everyone here today. Later this week, we’ll be staying in the kitchen as we take another look at the enduringly popular air fryers continuing to glut the market. Until then, take a good look around our site and don’t forget to follow us on social media. If you have any questions or feedback then don’t hesitate to get in touch. We love to hear from our readers and we’re happy to help out in any way we can. But most importantly, come back soon!